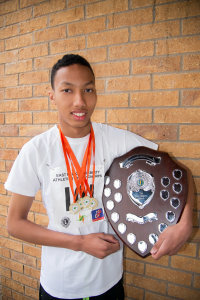 Karim Chan (u16 - 15yrs old) won the shield for the most outstanding performances at Eastern Region Disability Champs at Chelmsford and in doing so has been selected to represent the Eastern region team at the national champs on 27/28th June. Well done Karim! Karim Chan (u16 - 15yrs old) won the shield for the most outstanding performances at Eastern Region Disability Champs at Chelmsford and in doing so has been selected to represent the Eastern region team at the national champs on 27/28th June. Events 100m/200m/LJ. Well done Karim! Did you know about NVH Special Needs Athletics Club, run by Ian Nolan? Click here to visit their website.